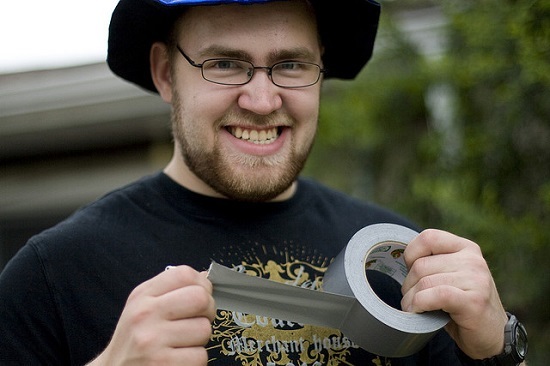 If it’s true that duct tape has been making rednecks into engineers since its creation in 1943, gaffer tape has probably been making the same unlikely folks into photographers for about as long. That’s a funny joke, to be sure, but there’s an astonishing amount of truth to it, especially since both types of tape were developed to perform astonishing tasks with great ease. In several ways, both tapes are very similar, but their differences make them ideal for their respective functions. By the 1910s, various types of tape were available, including several makes that were intended for specific purposes. This included, most notably, tape that was made of cloth that had been coated with rubber and treated with zinc oxide for use in hospitals for binding wounds. Cloth tapes were still not commonly available to the public, so a 1930 issue of Popular Mechanics carried a story describing how to make cloth tape by soaking linen in a heated mixture of rosin and rubber from inner tubes. The product that would eventually become known most commonly as duct tape was created by an ordnance factory worker named Vesta Stoudt, who also happened to be the mother of two sailors, who was worried that the seals on ammunition boxes that she was making would leak, and as a result cost soldiers their lives from precious time lost in battle. She wrote of her concerns to President Franklin D. Roosevelt, and accompanied her letter with a sample of a cloth tape she had created for the purpose. Soon, the War Production Board had asked Revolite, a division of Johnson & Johnson, to make the tape in an olive matte finish and that nicknamed “duck tape” by soldiers. The product that is commonly known today as duct tape is a pressure-sensitive cloth tape that is coated with polyethylene. The product is available today in a variety of backings, adhesives and colors. Its acceptance as a popular culture item has led it to be used in a wide variety of applications, from the ordinary, such as sealing duct materials to the, well, unusual, such as making wallets, prom dresses and tuxedos, and even wrapping USC’s “Tommy Trojan” prior to a recent football game. We Get the Picture. What is Gaffer Tape? A less common variation of duct tape is gaffer tape, so named from the lighting technicians–called gaffers–who work on motion pictures and in television. For purposes of their work, cameramen and photographers need to have a high level of control over the light that is allowed on their sets, which makes it difficult to use anything with a shiny surface, such as tapes. At the same time, studios and theatrical sets often require that things like wire be stretched across floors but cannot be allowed to become hazards or to be seen easily by the cameras or the audience. Thus, gaffer tape was developed. Gaffer tape is much like duct tape in that is has a cloth core, along with strong adhesive properties. The primary difference from duct tape, which it is often confused with, is the backing, which has a rubber base with a matte–nonreflective–surface. It is also more resistant to heat and can be removed from a surface and leave no residue on the surface to which it was adhered. Gaffer tape is also considerably more expensive than duct tape since it is made in lesser quantities, possesses more exacting specifications, and is predominantly marketed for professional use. In many ways, duct tape and gaffer tape are much the same. They are both known to have strong adhesives, can be cut by hand instead of needing to use blades, and can even be torn lengthwise to create smaller widths. Both duct tape and gaffer tape have become a go-to for adhoc repairs. There is also a version of gaffer tape that is still more specialized called spike tape, which is often used to diagram floor layouts in theaters. For lack of other means, both duct tape and gaffer tape are both used affixing items together, for labels, and other uses that often don’t have dedicated products, and yet to be solutions. Until those solutions are invented, however, duct tape as well as gaffer tape have both proven their use very well, thank you. Next Article What Kind of Tape Sticks to Brick?